Everyone's got something to hide except me and this monkey. Perhaps I should have saved this until Monday. “Your Monday Monkey” really has a ring to it. But then I’d sort of be committing to coming up with a picture of myself holding a monkey every Monday, and that could get pretty expensive. Yes! That’s me! Holding a monkey! I’m on the left. Guess I should say, that’s me at the age of ten. Yeah I had blond hair once. OK yeah, I had hair once. First it turned brown, then it curled up, then it started to fall off. The autumn of my life happened in my teens. That is, I think I was ten. I really don’t remember this photo being taken. Well I kind of do. I remember the event. 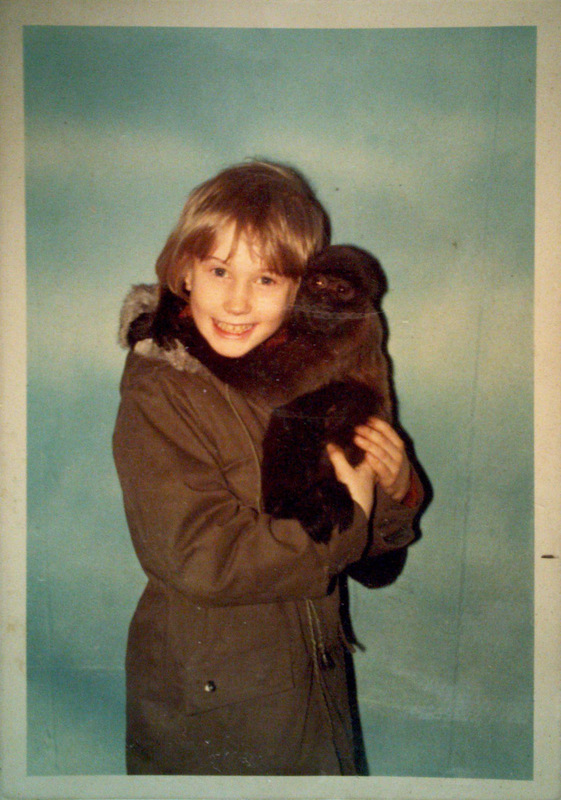 When I look at the expression on my face, I think I remember being too excited and too self-conscious and too worried about doing what I was told and smiling right to really make the most of the fact that a small primate had its furry arms around my neck. I remember it being over too soon. I just don’t remember where it happened. Or why. Why!? I actually think someone just came to our school with a camera and a monkey and offered to take pictures. It was a simpler world then. With more monkeys.